A massive explosion has rocked a fertilizer plant near Waco, Texas. Hundreds of people were likely injured, state official says. A nursing home was destroyed by the blast and numerous buildings were damaged. 03:40 GMT: A 96-year-old man who lived at a nursing home near the site of the disaster is being called the 15th fatality in the blast. He died a few hours after being evacuated from the home, but was not initially included in lists of the dead. 03:00 GMT: Some residents of the battered town of West are now being allowed to return to their homes. A total of 14 bodies have so far been recovered from the rubble. "We do not expect to find any more, but we'll see how that goes," assistant state fire marshal Kelly Kistner told reporters. 02:54 GMT: President Obama declares an emergency in West, signing a declaration making it official Friday night. The mandate will boost state and local relief action with federal aid. The Department of Homeland Security and Federal Emergency Management Agency (FEMA) will now assist the relief effort in the region, which saw 14 people killed and a still-unconfirmed number of first responders and others who remain unaccounted for. 12:00 GMT:The bodies of 12 people have been recovered as a result of search operations West fertilizer plant. Authorities have confirmed that about 200 other people injured. Texas Department of Public Safety Sgt. Jason Reyes said search and rescue operations are ongoing as authorities had searched and cleared 150 buildings by Friday morning and still had another 25 to examine. 02:54:Jeffrey Patterson, a professor at the Wisconsin University School of Medicine and Public Health, doubted the claim, during a conversation with RT, from some officials that the danger was over following the fertilizer plant explosion in West, Texas Monday. Patterson compared Wednesday’s blast to similar disasters at Chernobyl and the Fukushima nuclear meltdown. And while it’s impossible to adequately prepare emergency crews for an accident of such magnitude there are ways to prevent them in the future. The professor also questioned Texas Governor Rick Perry’s hands-off attitude when it comes to situations such as these. The most recent explosion unfortunately may be an indicator of loose policies in the US that allow major corporations to write their own laws, something Patterson says needs to change in order to eliminate the possibility of disasters like this becoming more commonplace. 01:02 GMT:More than thirty people, including ten first responders, were killed as a result of the blast, West Mayor Tommy Muska told USA Today Thursday. That number - which follows Muska's claim to Reuters that the death toll stood at 14 - has not been confirmed by local, state or federal authorities. 22:51 GMT: The Dallas Fire-Rescue department confirmed to the Associated Press that Capt. Kenny Harris was killed in while fighting the blaze. Harris, a resident of West, Texas, was a 52-year-old married father of three grown sons. He was off-duty when he helped fellow emergency responders Wednesday night. 22:32 GMT: Emergency officials have advised residents to boil their drinking water to eliminate the risk of a bacterial presence, according to KCEN, a local NBC affiliate. 21:16 GMT: West, Texas Mayor Tommy Muska reported Thursday afternoon that between 30 and 40 people are still missing after Wednesday night’s explosions, five of whom are firefighters. 20:54 GMT: Texas attorney general Greg Abbott said that people will be “physically scarred for years, but these are tough Texans." Abbott closed the press conference by warning business owners that price-gouging statutes have been activated across Texas, meaning anyone trying to raise prices on essential items should expect a lawsuit from the attorney general’s office. 20:48 GMT: Reyes admitted that officials do not know for certain if all fires have been extinguished. 20:45: GMT: A McLennan County Chief Deputy told the press that it the situation at the blast scene remained “very volatile." Fire officials are working "tirelessly" to eliminate the risk, he said. 20:35 GMT: ATF officials told KWTX they haven’t been able to investigate the blast because the area is still too hot. 20:28 GMT: During a press conference at West's Hillcrest Hospital, a doctor on the scene confirmed that the explosion victims suffered internal bruising from the concussion of the blast. Other hospital workers went to work Thursday morning knowing they would have to treat friends and family members. Skin damage, lung problems and injuries from debris have been treated. Twenty-eight people are currently being treated at Hillcrest. 19:15 GMT: The Czech ambassador to the United States Petr Gandalovic is set to visit West later on Thursday “to support the community in their time of sadness." The city of West contains a significant portion of Czech heritage with many people of Czech origin living there. 18:56 GMT: Spammers are taking advantage of the tragedy in West, University of Alabama at Birmingham’s spam-monitoring lab said. They are sending emails with subject lines including: “Fertilizer Plant Explosion Near Waco, Texas” and “CAUGHT ON CAMERA: Fertilizer Plant Explosion Near Waco, Texas.” But by clicking the inserted links people may infect computers with malware. 17:05 GMT:"We plan to open up the school Monday, but will give them as much time as they need," Perry said. 15:49 GMT: Heavy rain over West may affect the rescue operations, Waco police say. 15:43 GMT: Waco Police's William Swanton says at least 160 people were injured, but he expects the number will grow. 15:40 GMT: Swanton says there is no indication that a crime was committed at this point, despite the incident is being called a crime scene investigation. 15:31 GMT: Waco police say looting in the West neighborhood was minuscule, isolated, and taken care of and that homes are “secure”. 15:27 GMT: The whereabouts of the factory’s owners is still unclear, Waco Police Department Sgt. William Swanton said in his second briefing. Though Swanton believes they spoke with authorities in the morning. “My Administration, through FEMA and other agencies, is in close contact with our state and local partners on the ground to make sure there are no unmet needs as search and rescue and response operations continue,” Obama said. 14:13 GMT: One of the missing firefighters has been found and hospitalized. “I don’t know his condition is it serious or critical. My understanding he was also a volunteer,” Sergeant William Swanton said at the briefing. 14:00 GMT: There has not been official reaction or statements from the owners of the West fertilizer plant, Swanton confirmed. 13:50 GMT: Looters remain a concern, Swanton said, however he gave no details on the issue. 13:44 GMT: Swanton, whose team is assisting local emergency services, says he is not aware of “how many folks may still be trapped.” He says the situation at the fertilizer plant has been brought under control and the town of West is “secure.” There are no chemical leaks. “Last thing I heard about the fire at the fertilizer plant, it was slow burning,” he said. “There is a huge organization of mixed groups that are working together to find survivors, to find people who are injured,"he said. 12:57 GMT: Check RT’s media gallery of West, Texas, explosion. 12:29 GMT: Programs of mass care, feeding, and mental counseling will be launched at Abbott High School, overseen by American Red Cross, according to local media. 12:12 GMT: Texas Commission on Environment Quality says air is OK in West, Texas, after explosion, local media reports. 11:33 GMT: Still no access to explosion site, lots of smoke, heavy acrid smell – NBC’s Chris Van Horne reported. 11:21 GMT: Heavy rain is now falling in West, Texas. 11:17 GMT: The injuries of those hospitalized range between cuts, bruises and broken bones to burns, head injuries and breathing problems, local media reported. 10:54 GMT: The local Abbott High School is being used as a relief center - lots of supplies, cots, and water. 10:36 GMT:“50-60 houses in a five block radius were heavily damaged” – Mayor of West, Tommy Muska. 10:25 GMT: Heavy storms in Dallas (about 77 miles/123 km from explosion site). Gusty winds to 45mph and heavy rain. 10:14 GMT: US Environment Protection Agency’s mobile unit has pulled up to the explosion site in West, Texas, NBC News reported. 10:06 GMT: Seismic measurements in Amarillo, Texas, registered the blast at 2.5 magnitude – Waco police. 09:57 GMT: Police said the fire department has the blaze under control at the fertilizer plant in Texas. 09:56 GMT: Smoldering fire continued after the explosion outside and inside the building – police. 09:55 GMT:“We will see the casualty and injury rate rise” - Sgt. William Patrick Swanton from Waco police. 09:53 GMT:Due to the level of devastation, police are still going from house to house rescuing and checking up on people, police reported. 09:52 GMT:The first call of an explosion at the plant came in at 7:53 pm local time – Waco police confirmed. 09:48 GMT:“Houses leveled, businesses leveled, it literally destroyed everything around the plant” - Sgt. William Patrick Swanton from Waco police. 09:47 GMT: Police reports that at least 160 injured are being treated in hospital. 09:44 GMT: Police say they are treating the site of the explosion as a crime scene until they know for sure that it was an industrial accident. 09:43 GMT: 3-5 firefighters missing - Sgt. William Patrick Swanton. 09:40 GMT: Massive devastation in downtown West area: houses and businesses leveled - Sgt. William Patrick Swanton from Waco police. 09:39 GMT: 5-15 casualties estimated – Waco police. 09:01 GMT: West fertilizer plant stated in report that it presented no risk of fire or explosion, Dallas News reported. The report said ‘no’ under fire or explosive risks, with the worst possible scenario being a 10-minute release of ammonia gas that would kill or injure no one. West Fertilizer Co. admitted it had as much as 54,000 pounds of anhydrous ammonia. 08:48 GMT: A four-block area around the explosion was "totally destroyed,” AP quoted a member of the city council, Al Vanek. 08:43 GMT: The destruction from the explosion at the fertilizer plant covered 30 blocks and fires are still burning in certain areas, KCEN News quoted a Search and Rescue official. 08:34 GMT: The number of injured hospitalized increased to 179, with 10 additional people in triage and 24 still in critical condition, ABC News reported. 08:32 GMT: West Intermediate School was evacuated two months ago on February 12, 2013 due to fire from the fertilizer plant. The school district was not notified the plant was carrying out a controlled burn of pallets and brush. 08:03 GMT: The Texas fertilizer plant was cited for failing to obtain/qualify for a permit in 2006, local media reported. The Texas Commission on Environmental Quality investigated the plant after receiving a complaint of a strong ammonia smell. 07:53 GMT: Six firefighters, two EMS workers and one police officer are confirmed dead, according to West EMS Director Dr. George Smith. 07:39 GMT: Officials warn of possible toxic air after the explosion, local media reported. 07:30 GMT: Police say they continue to go from house to house clearing people from the area. 07:29 GMT: Full extent of devastation is still unknown, police said. 07:28 GMT: Firefighters and police officers likely unaccounted for in West; strong winds are hindering the rescue operations – police. 07:26 GMT: Cause of fire is still unknown, cannot rule out criminal activity, police said. 07:22 GMT: Small contingent of firefighters returned to the fertilizer plant. Fire is said to be under control – police. 07:19 GMT: Police confirm there were fatalities and expect the number to rise. 07:16 GMT: Many ambulance and medical personnel still on site removing the injured, police stated. 07:02 GMT: US Chemical Safety Board (CSB) heading to the explosion site, expected to arrive Thursday afternoon, CSB’s press release stated. 07:00 GMT: West Independent School District campuses will be closed Thursday and Friday. Residents warned to stay away from property, according to local news. 06:49 GMT: High winds in Waco, Texas, make it difficult for helicopter landings and take-offs needed for delivering patients for medical treatment, according to NBC News. 06:47 GMT: Dept of Public Safety concerned with one unexploded tank that is venting gas from fertilizer plant in West, Texas, local media reported. 06:35 GMT: 172 people confirmed hospitalized, 24 people in critical condition, 38-40 people in serious condition and 23 more people en route to be admitted to local hospitals. 06:29 GMT: Over 100 patients are being treated in two local hospitals, according to media reports. 06:20 GMT: All roads around the impact zone are blocked off, except to emergency vehicles, NBC reported. 06:10 GMT: Fire is believed to have started in an anhydrous ammonia tank before it spread to the rest of the plant buildings, local media reported. 06:06 GMT: Mayor of West Tommy Muska told residents to stay inside because of the hydrous gas in the air. 05:25 GMT:“Probably over 100 injuries,” while the number of fatalities remains unknown, says DPS' DL Wilson. 05:21 GMT: According to the DPS, they may have to evacuate the other side of town when the north wind comes through. 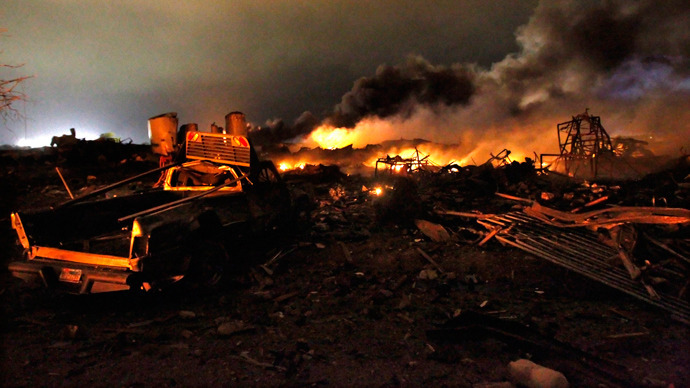 05:17 GMT: USGS registered the fertilizer plant explosion as a 2.1 magnitude quake. 05:15 GMT: Rescue services request that no more volunteers come to the scene to join the effort, since they would only impede the operation. 05:06 GMT: Plant is still smoldering, firefighters have difficulties getting to it to extinguish the remaining fires. Toxic fumes are rising from the site, says Department of Public Safety. 05:06 GMT: The apartment complex most affected by the disaster is “a skeleton” with 50 to 75 residences damaged. Rescuers are doing house-to-house search for victims, DPS says. 05:04 GMT: The 133 people from the nursing home were evacuated and taken to local hospitals, Department of Public Safety reports. 04:58 GMT: Most of the firefighter team that immediately responded to the fire at the chemical plant is unaccounted for, West’s mayor says. Four to five of them are missing. 04:55 GMT: The Texas explosion injured at least 200 people, 40 of them critically, Department of Public Safety spokesperson says, according to ABC. 04:43 GMT: HazMat squads have been deployed in the area to analyze the environment for possible toxins. 04:42 GMT: A nursing home and a middle school reportedly caught on fire. Thankfully, the school was out of session. 04:34 GMT: People are coordinating the relief effort over Twitter, compiling a list of those willing to provide housing to those who lost their homes in the explosion. There are also calls to donate blood to local hospitals. 4:21 GMT: "It was like a bomb went off" - West Mayor. 4:20 GMT: Approximately 50 homes, one school, an apartment complex and a nursing home have been completely leveled. 4:18 GMT: KWTX reporter tells KHOU that the town of West is being evacuated partly for fear of toxic fumes currently spread around the area. 4:15 GMT: The Mayor of West says the fire is under control. 4:10 GMT: @Newyorkist says Houston's KHOU station removed its tweet claiming that 70 people were confirmed dead in the Texas explosion. 4:08 GMT: West, Texas Mayor Tommy Muska tells NBC he had no information on exact casualty numbers as of 12:05 EST, but that the plant was "fully engulfed" in flames before it exploded. 4:00 GMT: Sixty-one people have been admitted to the Hilcrest Hospital in Waco. Twelve currently are in critical condition, said Hiclrest's CEO to CNN. 3:48 GMT: Law enforcement is advising residents in West to leave town immediately for fear of secondary explosion at fertilizer plant. 3:40 GMT: 70 people are believed to be be dead, including five firefighters and one police officer. The FAA has placed a temporary flight restriction over the surrounding airspace. 3:35 GMT: Dr. George Smith, Director of West EMS, told KWTX he believes there are between 60 and 70 people dead. 3:34 GMT: Between 75-100 homes and businesses have been completely destroyed with the number injured exceeding 200, as per ABC News. 3:30 GMT: The football field that was being used as an emergency command center and helicopter landing pad has been evacuated due to fears of a second explosion.